At the end of the month I am vending at the Ceramics Guild booth at the Corvallis Fall festival and I also plan on opening up my studio again for the South Town Art Walk this December. My primary goal is to create enough work for these upcoming shows that I've committed to and am very excited about (and with the Fall festival being 3 weeks out I am already feeling a little pressure to produce more more more even though I currently have *just enough pieces to fill my shelves and have some extra)! My secondary goal is to stick with the flow of production and continue to create through the deadlines and keep a steady supply of work flowing. It can be a delicate balance to flow between my functional mugs and my sculptural work but I am finding that setting time aside every day to work in my studio is key to keep things moving. One of my goals for the year was to participate in the Corvallis Fall Festival- however, I had abandoned this idea after missing the February deadline and feeling like I could not produce enough work to fill a booth let alone put together an entire booth (did I mention I have a 16 month old?!!)! BUT I happened to join the Willamette Ceramics Guild and get a spot in the shared booth space this year, which is perfect for me! I will have a 3' x 6' space to fill and the shelving/ canopy are all provided. Fantastic! 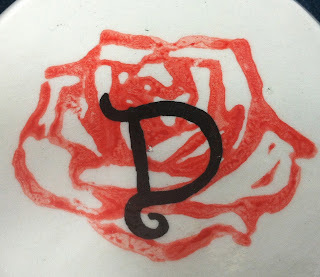 My new and improved logo- handmade stamp and painted D signature on every mug!